Eric Holtgard: Source: Hillsborough County Sheriff’s Office. 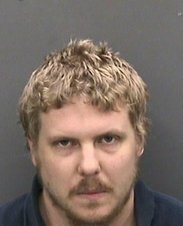 Purported Tampa-region “sovereign citizen” Eric Holtgard had been out of jail less than 10 hours before he was arrested a second time for menacing and brandishing weapons, the Hillsborough County Sheriff’s Office said. In the first incident on Nov. 20 just after 3 p.m., Holtgard, 27, appeared at a car dealership, started screaming at employees and patrons — “then pulled a Glock .45 caliber from his waistband and pointed it at a patron/victim and threatened several times he was going to kill him,” the agency said. Holtgard then fled. Deputies arrested him a short time later after a traffic stop. “During an inventory search of Holtgard’s vehicle, deputies located several loaded firearms, to include an assault rifle, two handguns, ballistic plates, ballistic ammunition, and paperwork advising he was exempt from Government statutory law, in the vehicle,” the agency said. After searching Holtgard’s Tampa Palms apartment with consent, the agency said, deputies found a “tactical shotgun, Glock pistol and 32 magazines and ammo.” Those items were impounded. Holtgard, who has a valid permit to carry concealed-weapons, bailed out of jail at 2 a.m. on Nov. 21, several hours after his arrest, the Hillsborough agency said. When deputies responded, they determined the man was Holtgard — this time at his mother’s house. He was arrested again, marking his second arrest in less than 24 hours and the second time Holtgard had menaced people innocently going about their own lives: workers and patrons at a car dealership, and the yard man, the agency said. “Detectives have also seized additional firearms including several assault rifles from the Buckingham Loop address which is the home of Holtgard’s mother. Holtgard was transported to the Orient Road Jail where a request for no bond will be made,” the agency said. The Nov. 20 charges include Aggravated Assault with Deadly Weapon and Possession of Armor Piercing 50 Caliber Ammunition. The Nov. 21 charges include Aggravated Assault with Deadly Weapon, the agency said. Shown below are the impounded weapons and ammo. 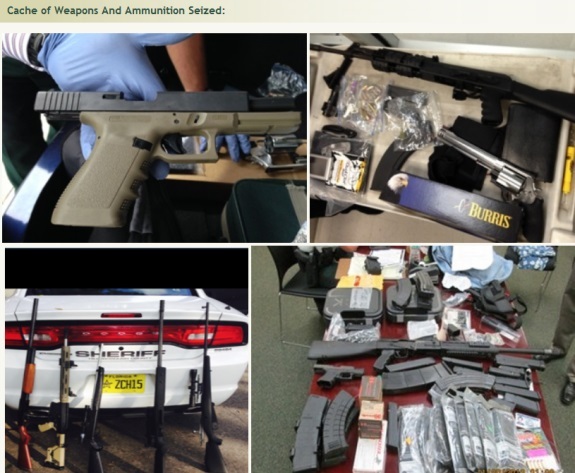 Weapons seized during the probe of purported “sovereign citizen” Eric Holtgard in the region of Tampa, Fla. Source: Hillsborough County Sheriff’s Office.